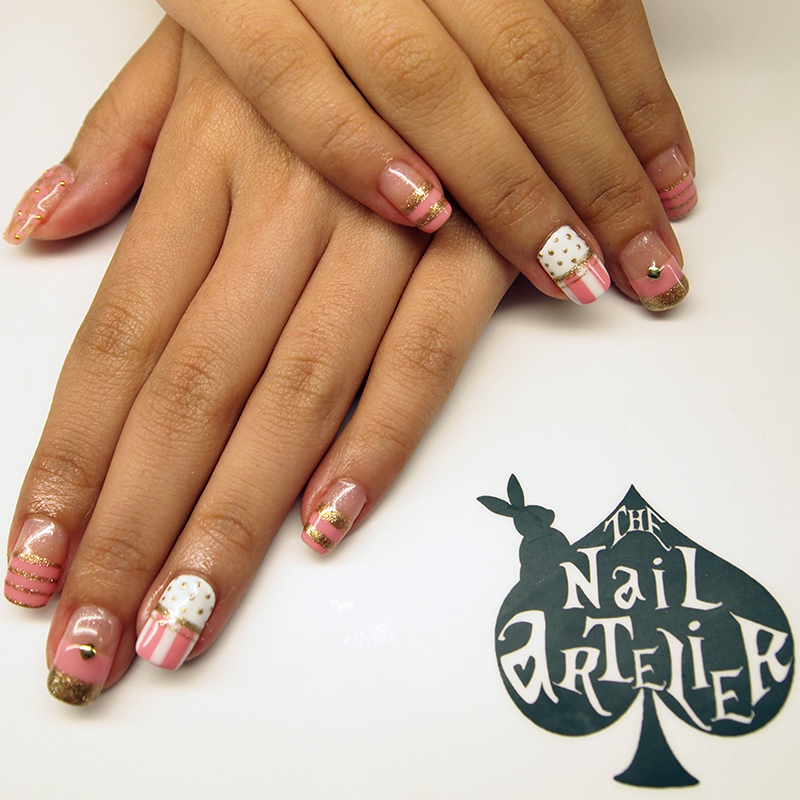 Gel mani: Bows, hearts, polka dots! 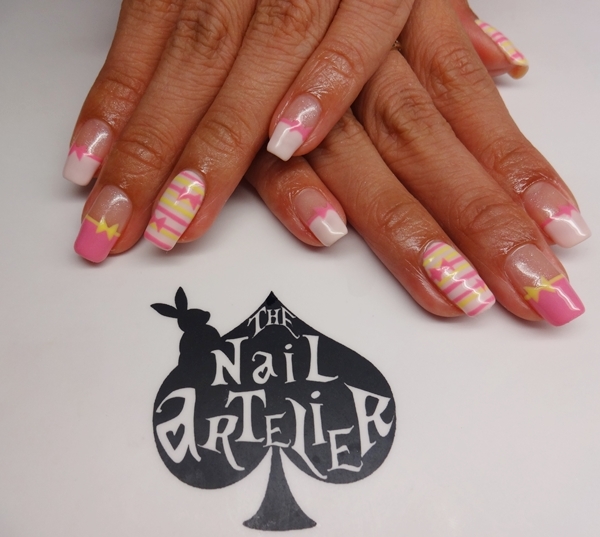 This set is really sweet and girly! In pretty shades of pastel, I love it! 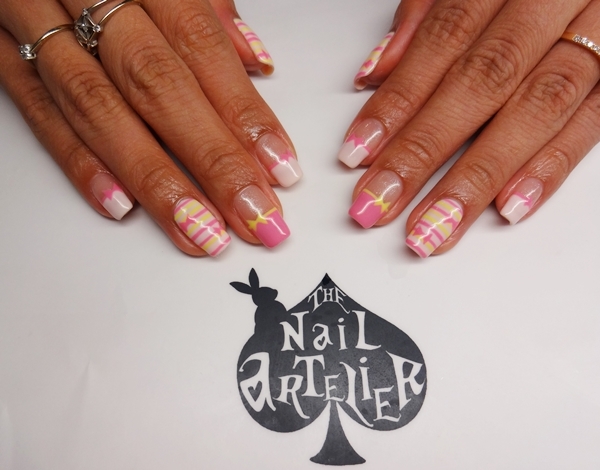 My favourite nail is this set is the yellow tip with a ribbon! Makes it look really blouse-like! Gel Mani: Monsters Inc. Mash Up! This set is really cute, and look at Boo!!! Super adorable! 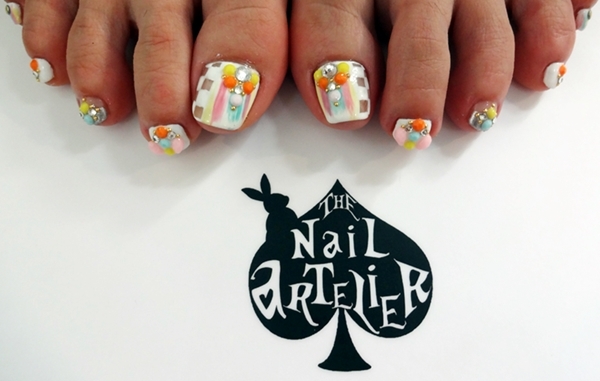 The set is mainly inspired from a Taiwanese nail artist – Asis Weng, who’s so incredible with cartoon nails. 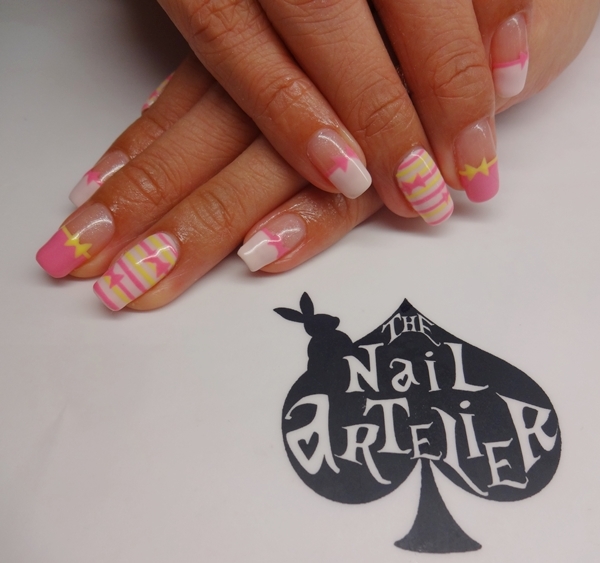 It looks especially cute on shorter nails, as long slim nails will lose the “cartoon effect” actually! 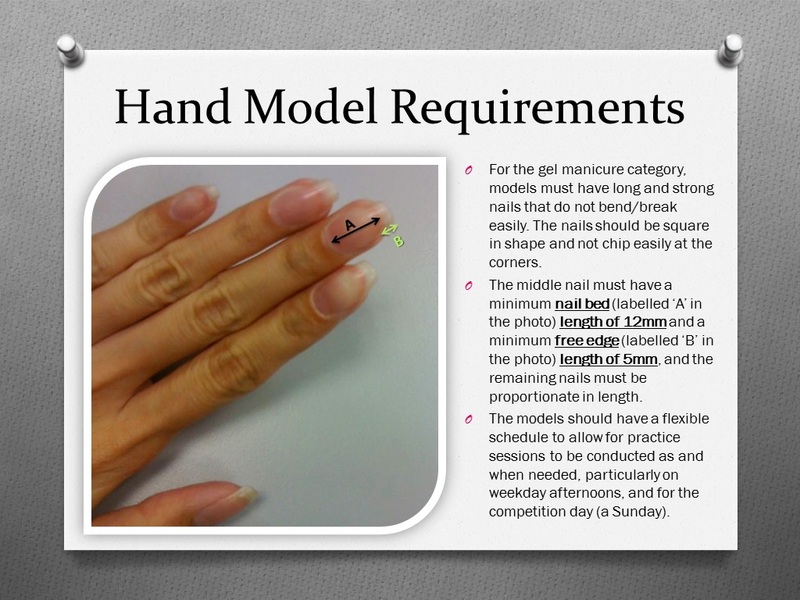 So, don’t worry if you don’t have long nails, we can work magic on short nails too! 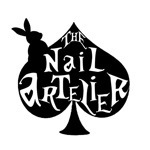 Today, I have a pretty interesting set of nail art to share with everyone! 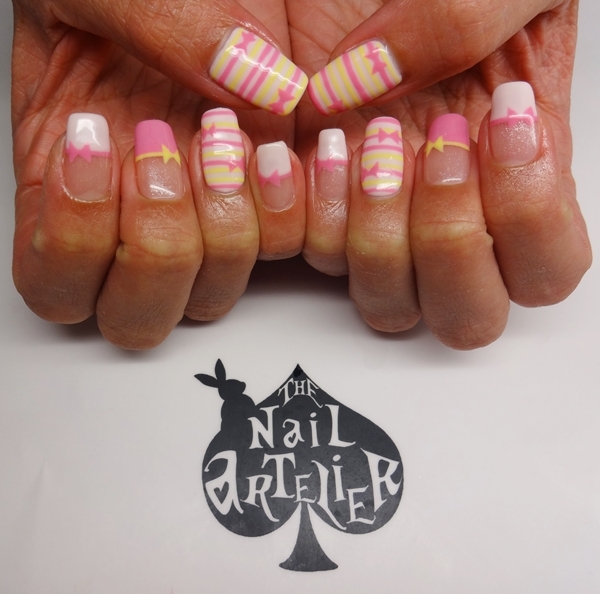 This customer gave me a picture of different paper stock designs for scrapbooking purposes, and told me to customise/incorporate that onto her nails! 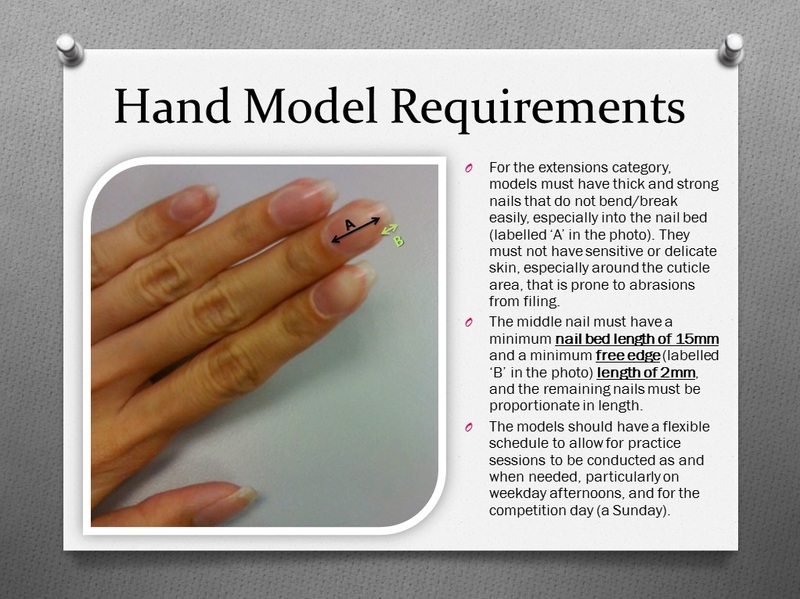 It doesn’t sound too difficult, but it gets a little tedious when I have to scale down the designs/decide which part of the design to translate onto the nail! There are five different designs that I have picked, out of the seven that she showed me! I thought it was pretty interesting, don’t you think so?? 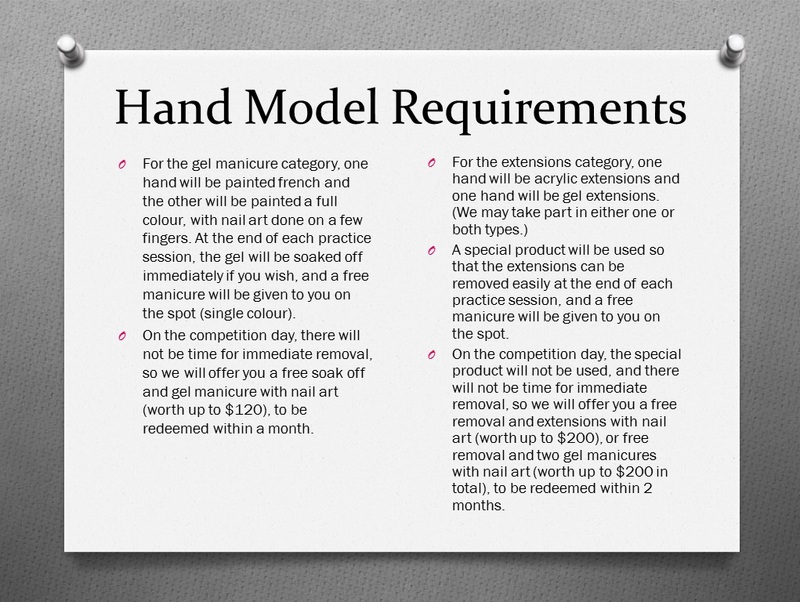 We’re on a search for nail models for a local competition in mid-November! 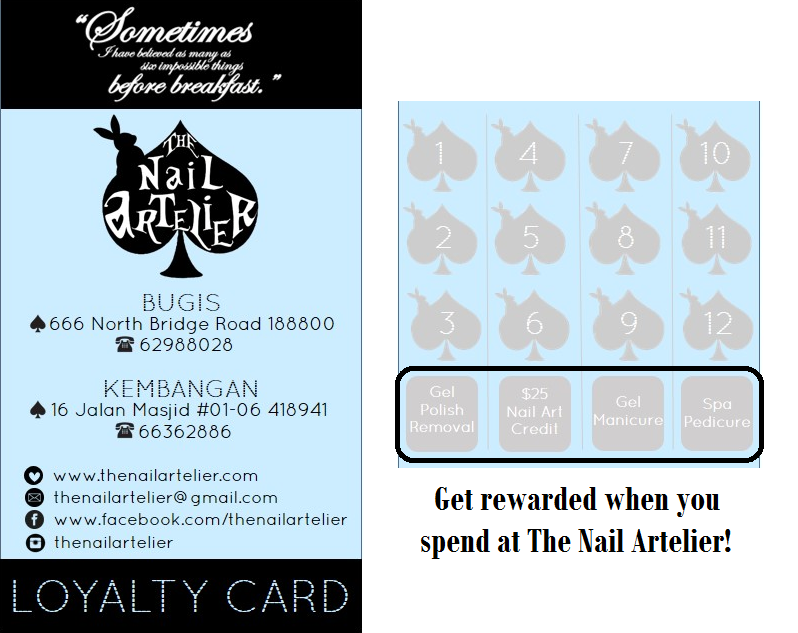 To apply, please email thenailartelier@gmail.com with pictures of your bare nails. Thank you! 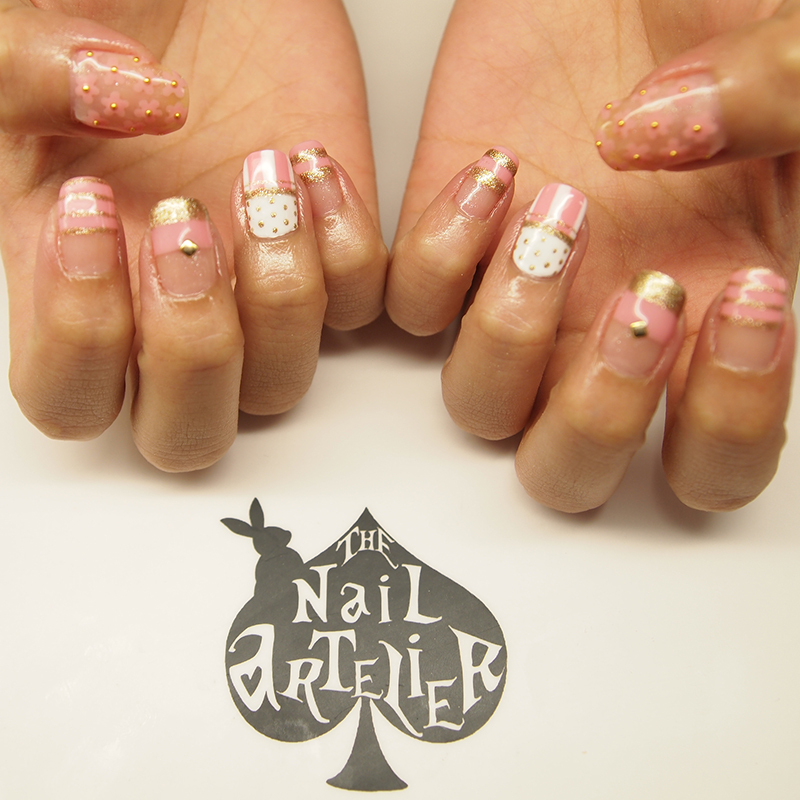 This is an interesting combination, which my customer picked out from one of our Japanese nail art magazines. 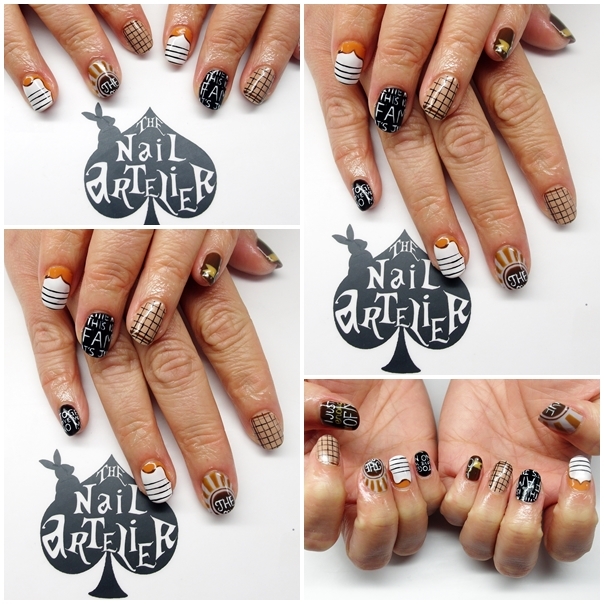 The big toenail is split into two sections, one with a peekaboo checkered design and the other with an abstract marbled base with embellishments. 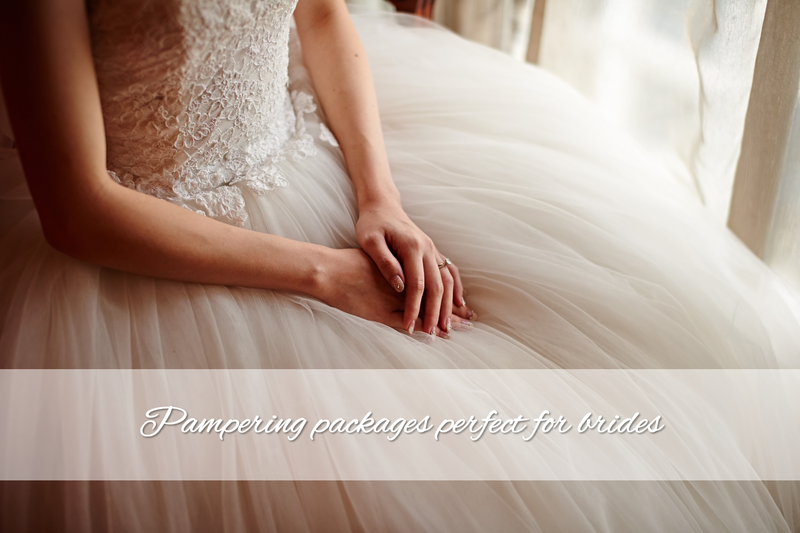 Most of the time used for this set was spent on adding all the many embellishments! 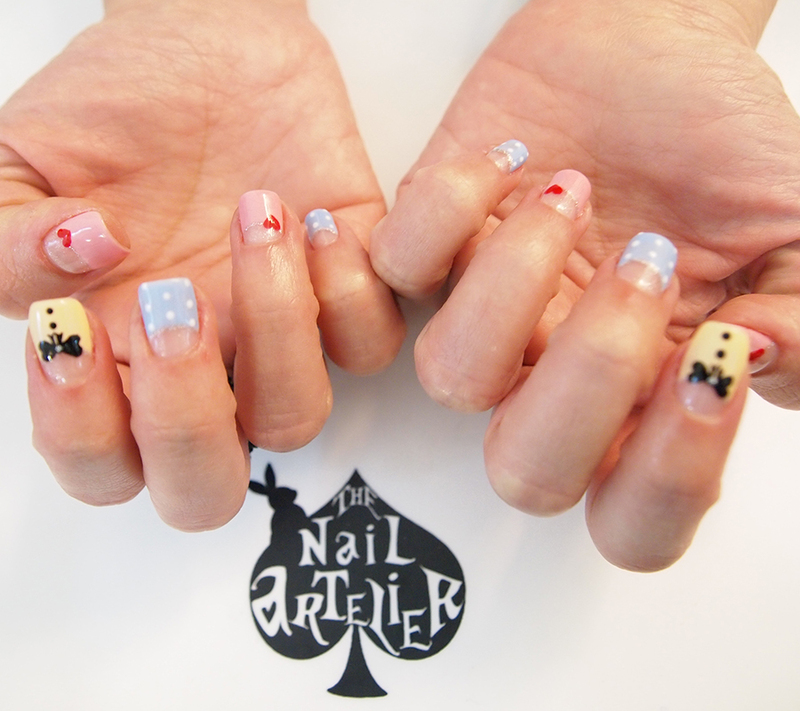 And psst… this set was done entirely with normal nail polish. I was very tickled when some customers who saw this set were shocked to find out that it could be done with normal nail polish!